The hotel has heaps of period character and some first class Thai dining. Located in the centre of Stround within five minutes of the train station. 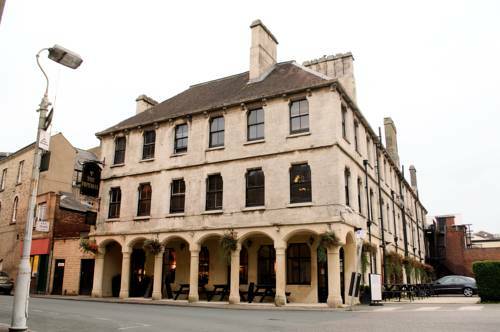 The Imperial Hotel can be found at the centre of Stroud close to the Train Station. A regular rail service runs to major cities like Gloucester and Bristol making the Imperial a perfect base to visit some of the Cotswold's and South West's most beautiful towns and villages. The hotel sensitively combines elements of the original Coaching Inn character with amenities that satisfy the more demanding 21st Century traveller. There are period features dating back over two hundred years the on site restaurant serves authentic Thai cuisine alongside a traditional English menu. The bar also offers a range of fine wines, crask ales and some delicious single malt whiskies. All 25 hotel bedrooms are en-suite and feature a flat-screen TV, hairdryer and refreshment facilities. A full English breakfast is available each morning to start your day off. Stroud is at the heart of the Cotswolds and is enclosed on all sides by stunning English countryside and delightful wooded valleys.